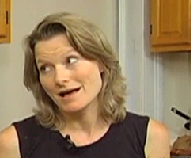 Emily Gould invites Jennifer Egan, author of A Visit from the Goon Squad, into her home kitchen to make macaroons. Jennifer Egan! Cooking the Books is directed by Valerie Temple and shot and edited by Andrew Gauthier. You can see all the Cooking the Books episodes here or even subscribe via iTunes.